Another authoritative performance hailed by manager by Jamie Vermiglio as ‘perfect’ extended the Magpies’ lead at the top of the National League North table to seven points. Home fans in a crowd of 1,314 revelled in the quality of Chorley’s attacking football and the clear-cut margin of this victory was thoroughly deserved. Guiseley made a fight of it in the first half and created a couple of decent openings. But the reality was that Matt Urwin in the home goal was not called upon to make a save of note throughout the match. Having done well to reach half-time only one goal down, the Lions succumbed tamely once Chorley quickly added a second after the break. And in truth the Yorkshire side’s inability even to deprive the hosts of the ball in the last 20 minutes was frankly embarrassing. Both Josh Wilson and Adam Blakeman registered their 10th goals of the season and the Magpies are now the league’s joint leading scorers with 53. As Chorley started firmly on the front foot, it was Wilson who opened the scoring in the 10th minute. A wonderful cross-field pass by the outstanding Courtney Meppen-Walter released Matt Challoner and his prompt, low centre was nonchalantly flicked into the net by the on-the-spot Wilson. 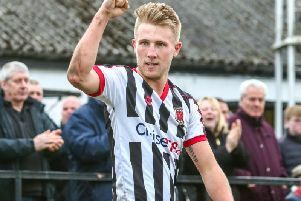 Blakeman fired a free-kick inches over the bar and a Marcus Carver cross-shot flew just past the post as Chorley sought to double their lead. But Guiseley were a threat on the counter-attack and Scott Leather did well to cut out a menacing short centre from the tricky Kaine Feix. Then Curtis Morrison raked the home goalmouth with a searching low ball which no Guiseley colleague could quite reach to turn into the net. There the danger ended for the home side, who were twice close to a second goal as the interval approached. Wilson saw a clever curling effort tipped past the far post by Lions’ keeper Martin Dewhurst, who then did even better to athletically palm aside a fierce shot from Elliot Newby. The destination of the points was effectively settled three minutes after the break when Blakeman advanced on goal and drilled a magnificent shot low into the corner of the net past a motionless Dewhurst. The keeper did very well to keep out a stinging drive from Meppen-Walter before on 61 minutes the crowd erupted to acclaim another superb strike when Alex Newby added the gloss to one of a stream of eye-catching build-ups with an explosive finish from 20 yards. Such was the Magpies’ unchallenged dominance in the final quarter of the match that they were able to indulge in lengthy spells of possession football at virtually walking pace. And it must be said that they will not pick up three easier points in their now very realistic bid for the title. CHORLEY : Urwin, Challoner, Blakeman (Cottrell 52), Teague, Leather, Meppen-Walter, A Newby, O’Keefe, Carver (Hooper 73), Wilson (McGurk 69), E Newby. Subs (not used): Jordan, Eccles.